Stylish, compact and lightweight but built for the professional and affordable for the hobby user too. Loaded with features and with a highly consistent power curve, the Z1-53 is the tool to use when you want quality, reliability and durability. It fires 53 Type staple 4-8 mm in leg length. 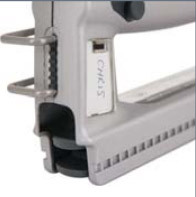 Linear Power Curve - Avoids that uncomfortable “snap” at the end of the firing cycle, which reduces hand strain and improves the level of comfort during prolonged periods of stapling. Stainless steel belt hook and personalisation window feature on all models.